'Thor' Announced for Blu-ray and Blu-ray 3D! The mighty hammer will fall this September for the high-definition formats! 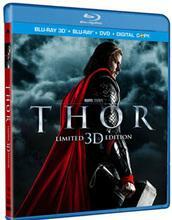 In an early announcement to retailers, Paramount will release 'Thor' on high-definition on September 13. 'Thor - 3D' will also be available on the same date. The god of thunder comes to life in Kenneth Branagh's action fantasy starring Chris Hemsworth as the arrogant Asgardian legend, Anthony Hopkins as his father Odin, Natalie Portman as Jane Foster, and Tom Hiddleston as the mischievous Loki. The releases will be a Blu-ray/DVD/Digital Copy combo pack with 1080p video, a lossless soundtrack, and over 80 minutes of features including two featurettes, a sneak peek for Joss Whedon's 'The Avengers,' and more! Suggested list price for the Blu-ray is $44.99 and the Blu-ray 3D is $54.99. You can find the latest specs for 'Thor' and 'Thor - 3D' linked from our Blu-ray Release Schedule, where they're indexed under September 13.